As you enter this ½ acre wooded lot you will find a secluded hideaway. 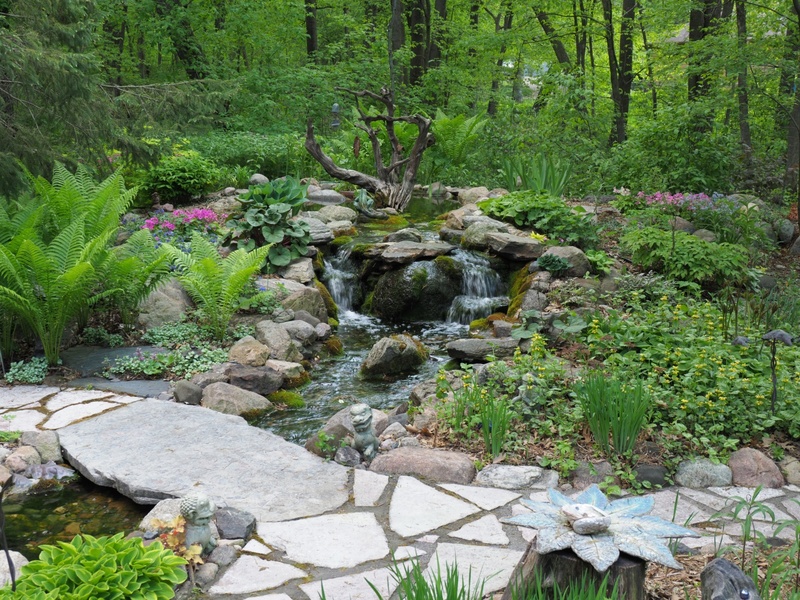 The backyard is filled with woodland plants that surround the waterfall, pond and stream area. 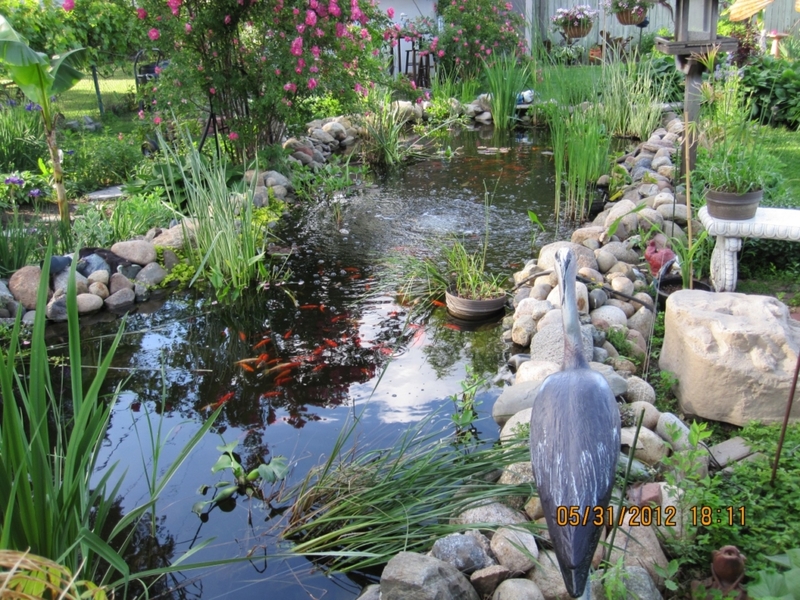 The main pond area is 12 ft X 17 ft with an overall length of 80 ft. 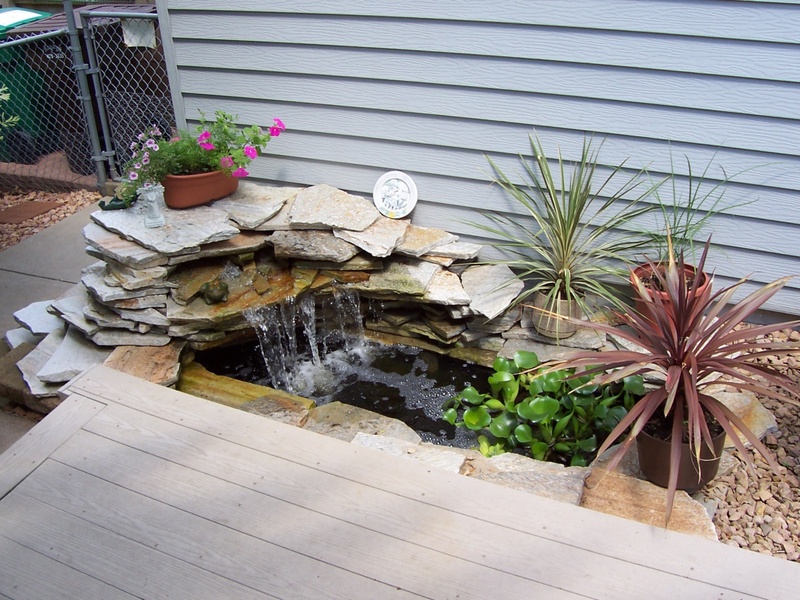 It is a filterless pond system with natural filtration provided by upper and lower bog areas. 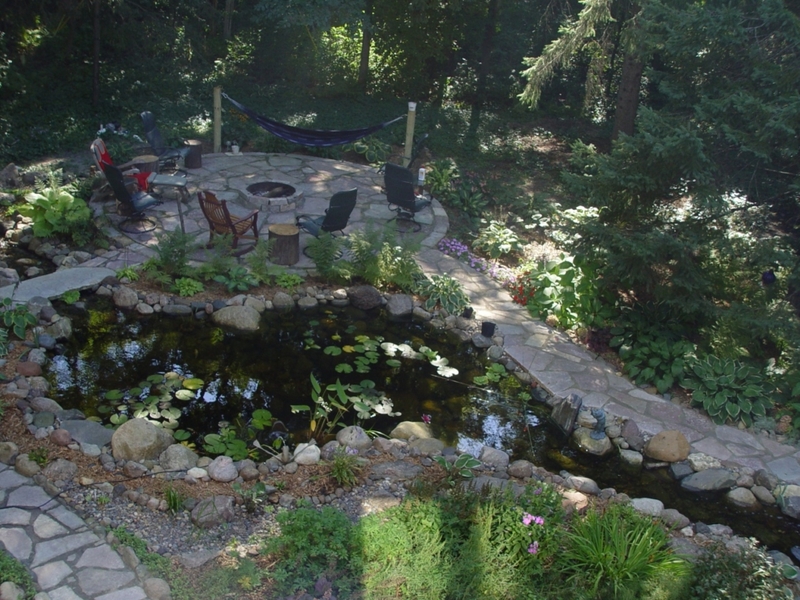 The flagstone path leads you along the pond to a patio and fire pit. 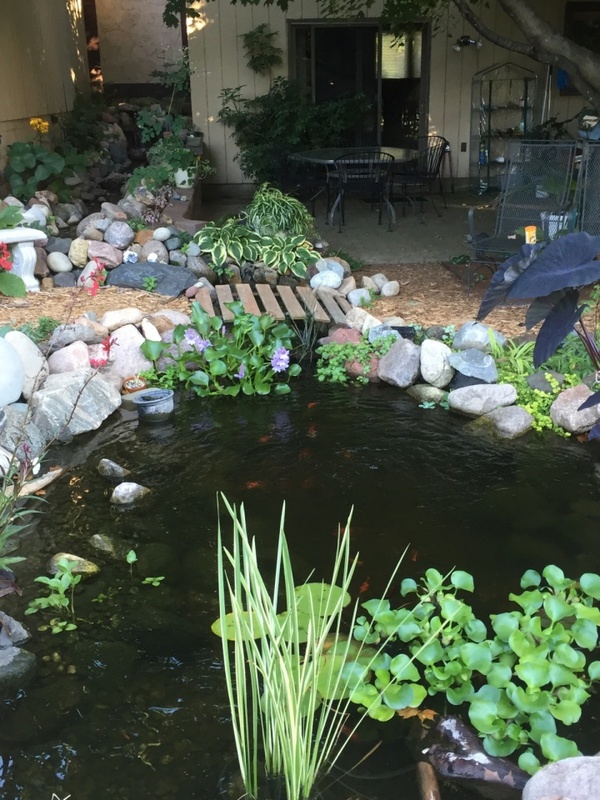 Don’t miss the custom garden and pond lights and use of driftwood placed in upper pond area. This site is a totally private space in a suburban neighborhood. 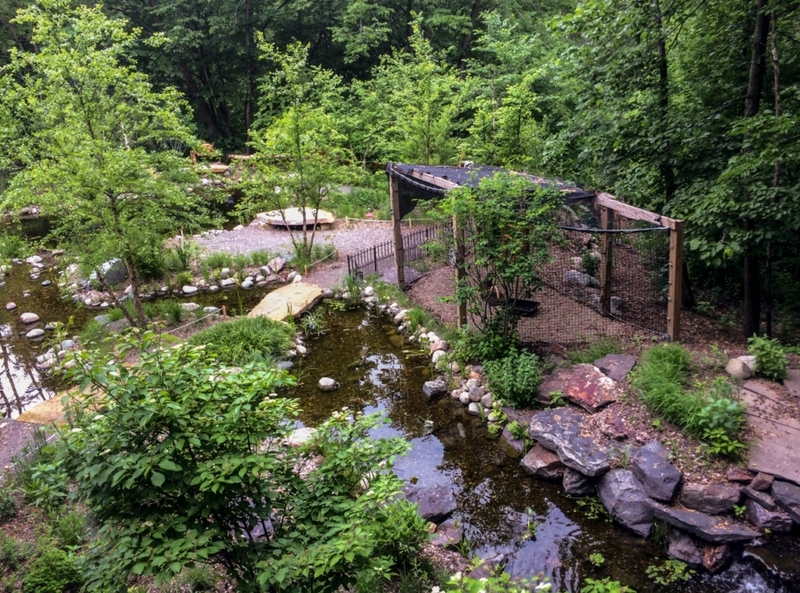 The Westwood Hills Nature Center Water Garden has a 120 ft stream that flows into a 40 ft x 30 ft pond as well as a shallow wet meadow. The pond is 7 feet deep. A 15 ft stream flows out of the pond and cascades over a 6 ft waterfall, ending in a lower bog. 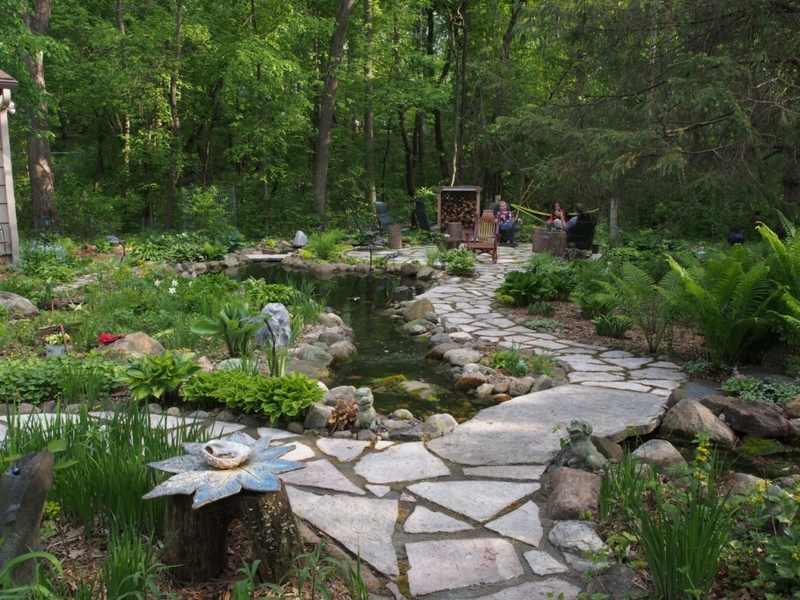 Over 90 MN native plant species can be found in the woodland shade gardens, prairie gardens, pond, and streams. This site has chipped granite trails, stone bridges, “Art Rocks”, benches, an elevated walkway, an overlook deck and a captive Red-tailed Hawk and Barred Owl. 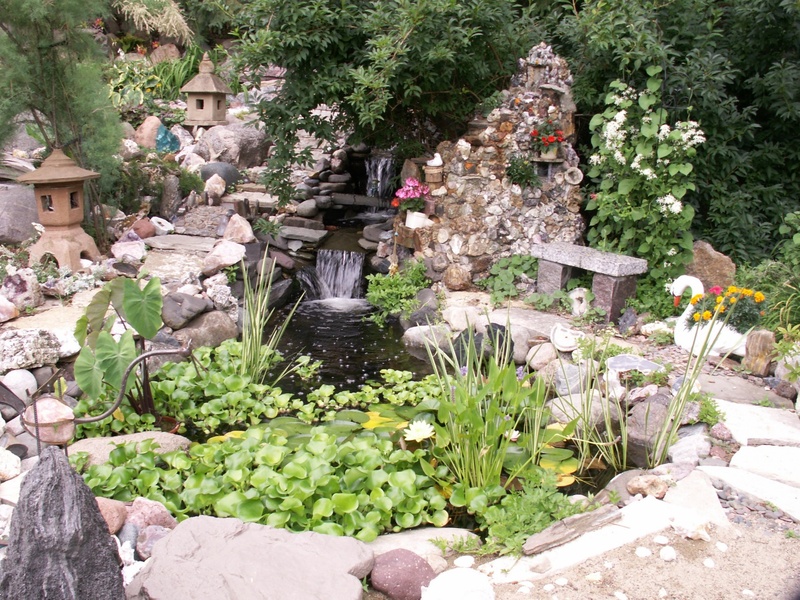 This site features a 900 gallon pond with two streams and two waterfalls. A collection of rocks of all sizes and colors from around the world are featured throughout the site. The site contains flowers, a shade garden, a rain garden, paths, a fountain and fireplace built from the rock collection. Don’t miss the small pond in the front yard. 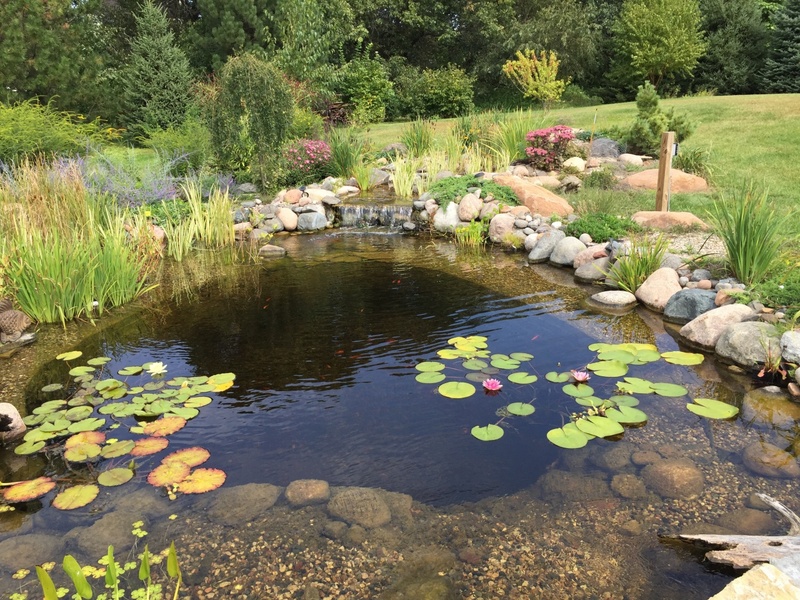 This site was featured in Minnesota Garden Magazine in 2013. 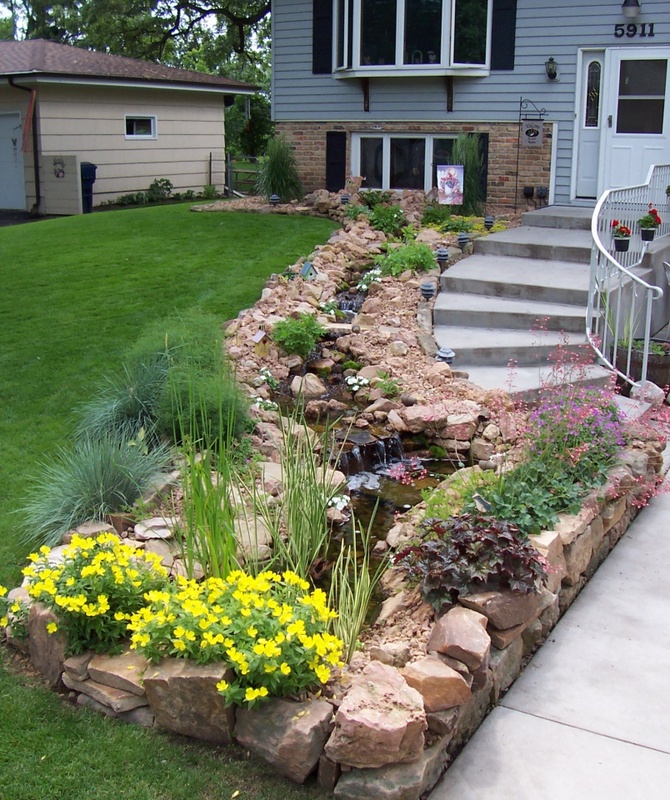 The slope of the backyard is an ideal setting for a pond and stream. Walk the crushed granite rock paths and cross the bridge over the waterfall that connects the two large ponds. Take notice of the carefully stacked rocks that line the sides and bottom. You will also find a creatively designed rain garden and compost bin system. This site was recognized by the city of New Hope with the Environmental Sensitive Design Award. This large suburban lot hosts a long stream and pond with a bog filter. 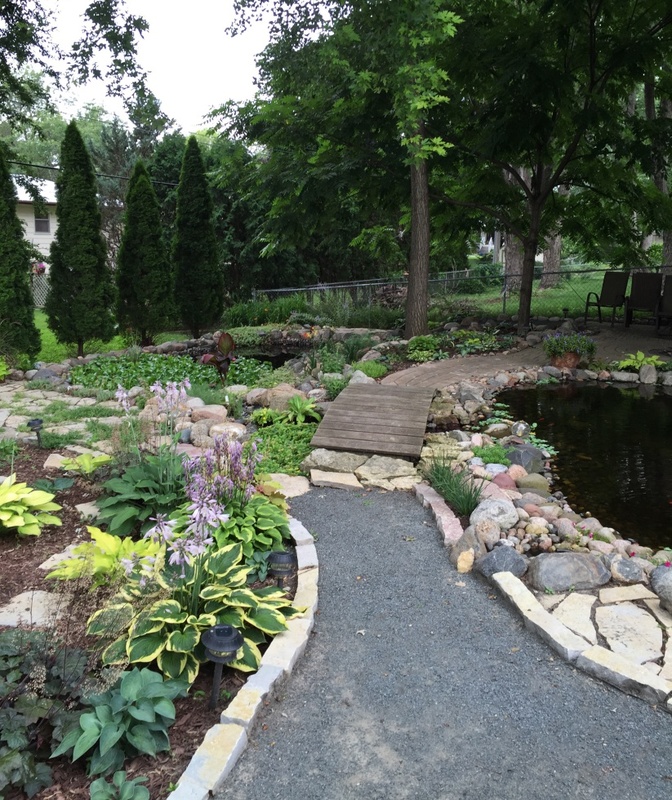 A few years ago this site was the “build a pond site” on the tour…see how it has developed. 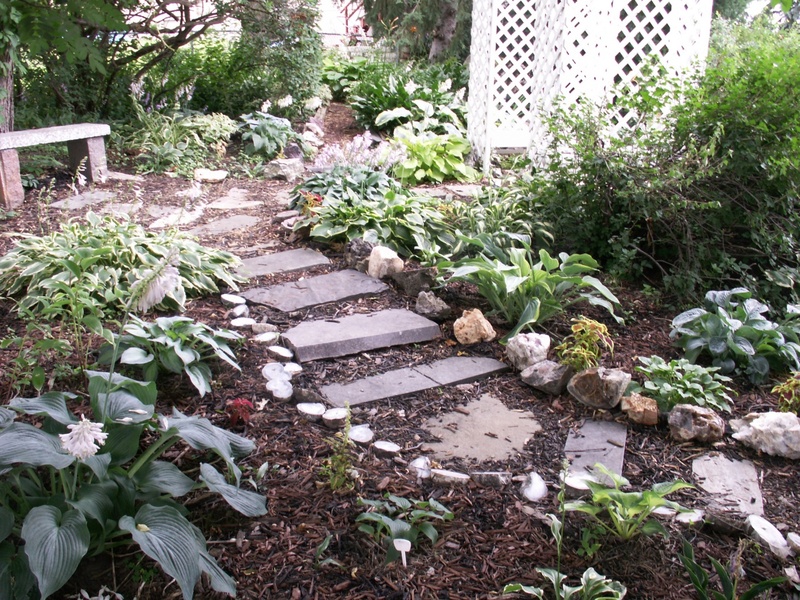 Cross a small foot bridge to the patio adjacent to the pond surrounded by shrubs and perennials. From the patio swing you can enjoy the fish, birds, and the soothing sound of the water. Don’t miss Al’s enclosed vegetable garden which keeps unwelcome visitors out. 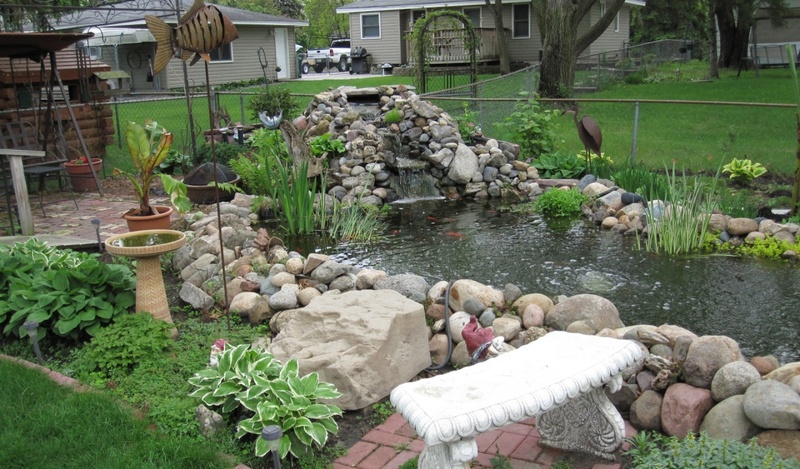 This standard size city lot has a river, several ponds, barrel ponds and fountains. 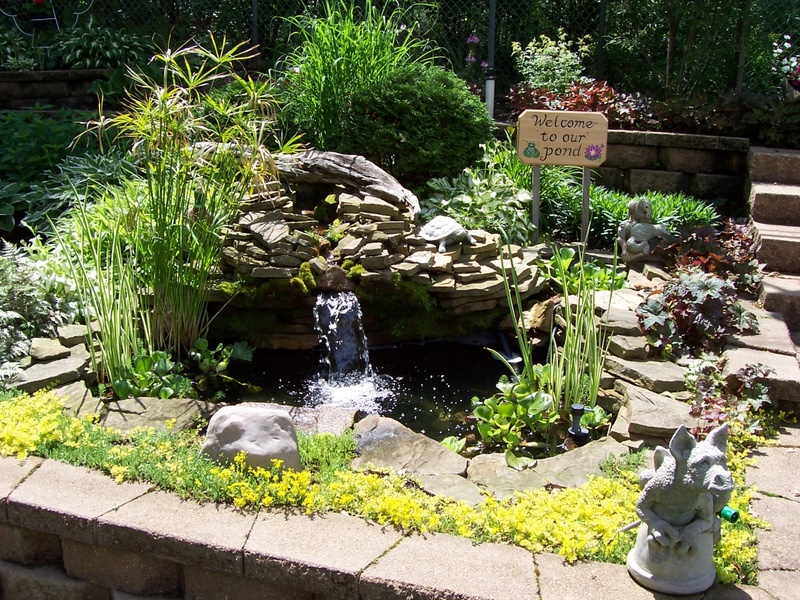 The water features include a 35 ft river in the front yard flowing into a small bog garden. 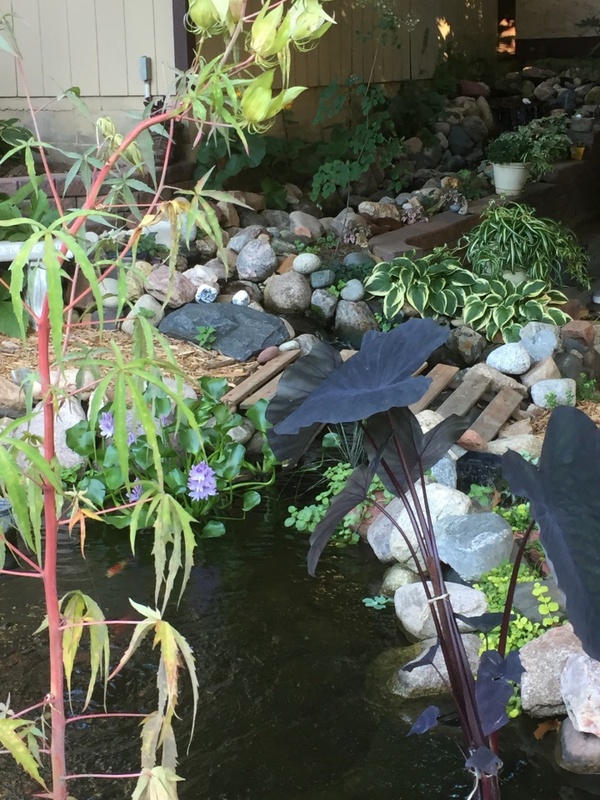 The backyard has 2 waterfall ponds, a 4 ft deep “holding” pond for keeping plants and fish during the winter, a small water lily pond, and 2 barrel ponds. 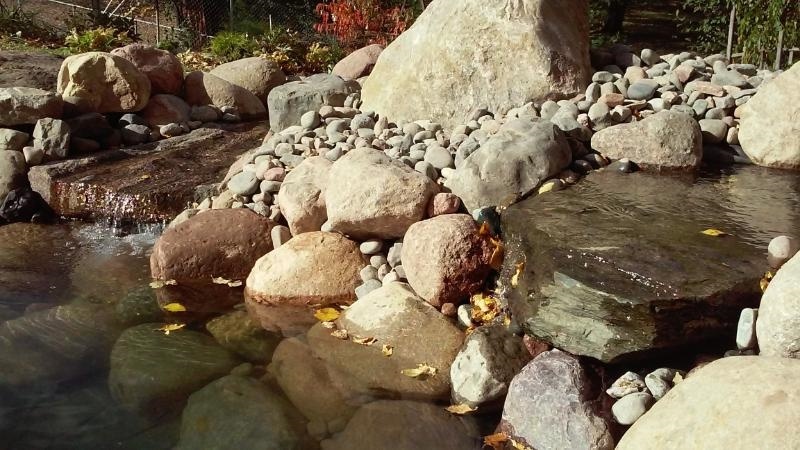 The water features are constructed with molded and rubber liners and have no skimmers or chemicals used for filtration. 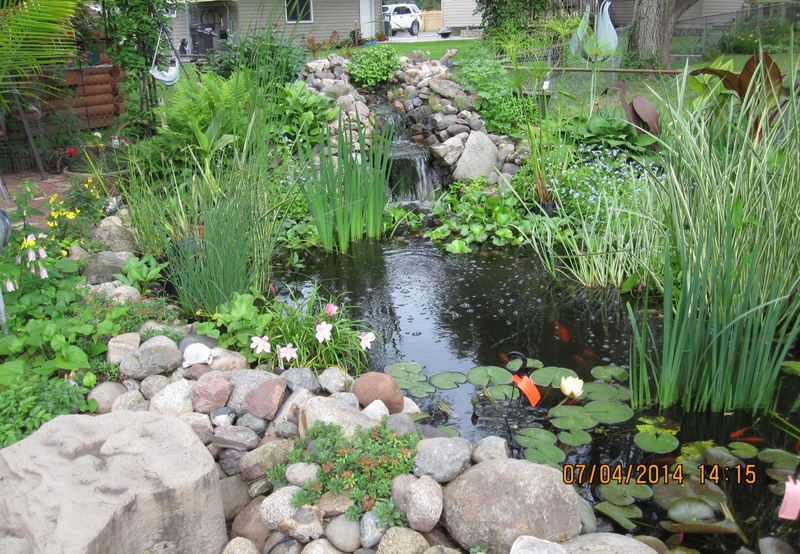 This site has been featured in the Star Tribune and won the 1st annual New Hope city garden award. 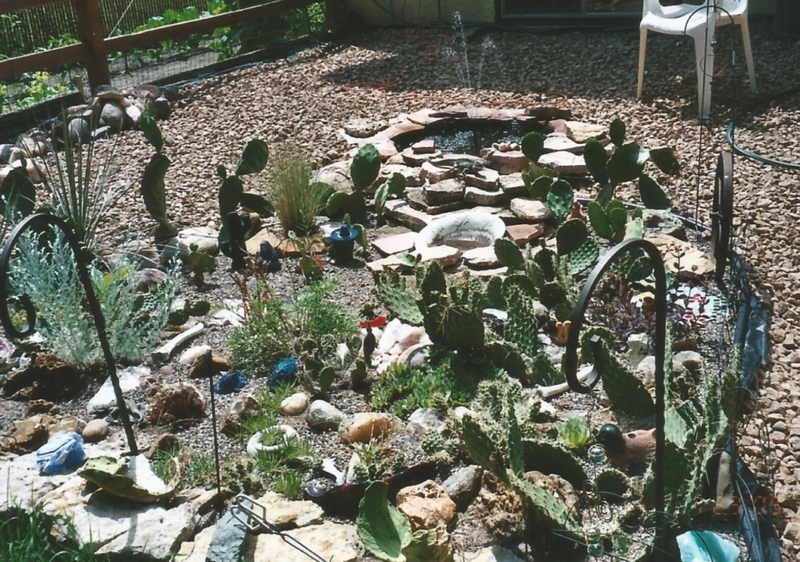 Located on this suburban site are 2 small ponds, a cactus garden, and a fairy garden. Throughout the site you will find garden art, garden statuary, and a collection of colorful flamingos. Some of the garden art was created by the homeowner. Carol is a self- proclaimed “hosta-holic” with 80+ hosta varieties. 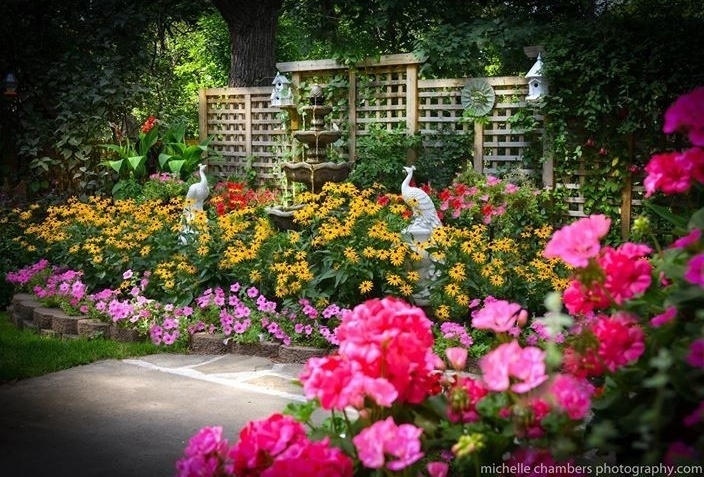 This garden paradise is located above the Mississippi river basin. There are two small ponds, a waterfall, and 11 other fountains. 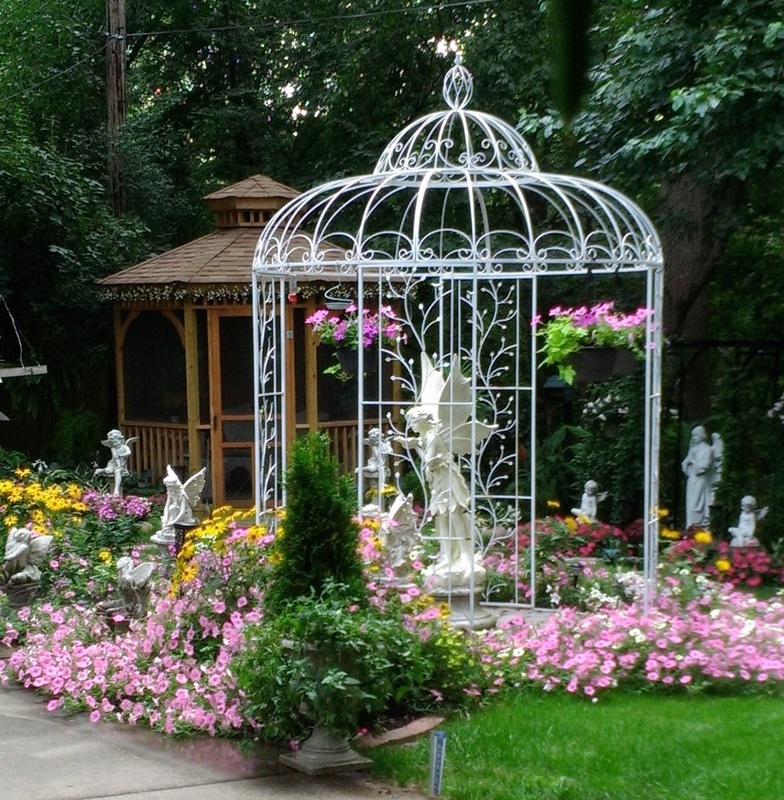 The gardens are filled with structures and statues, including a screened gazebo and pergola/gazebo hybrid built by Tim. 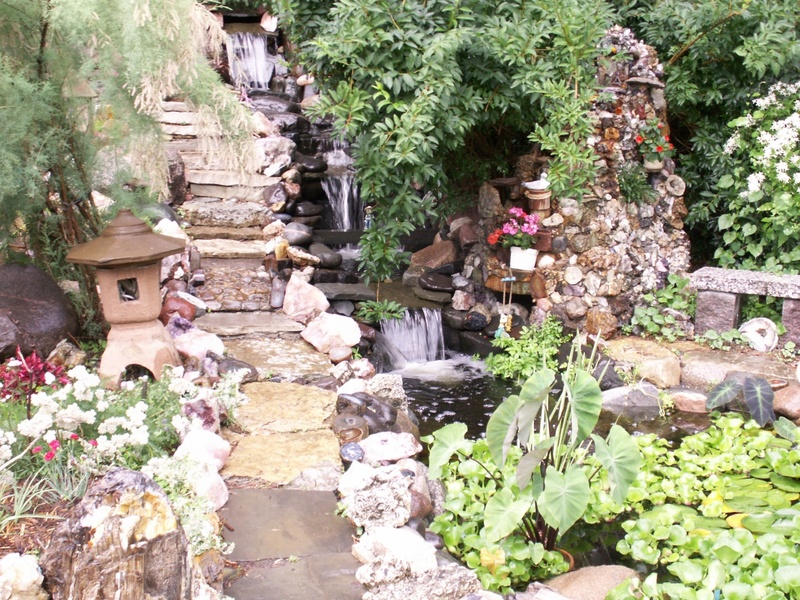 The yard is divided into different areas: a Japanese themed garden, a fairy garden, and a sunken garden. 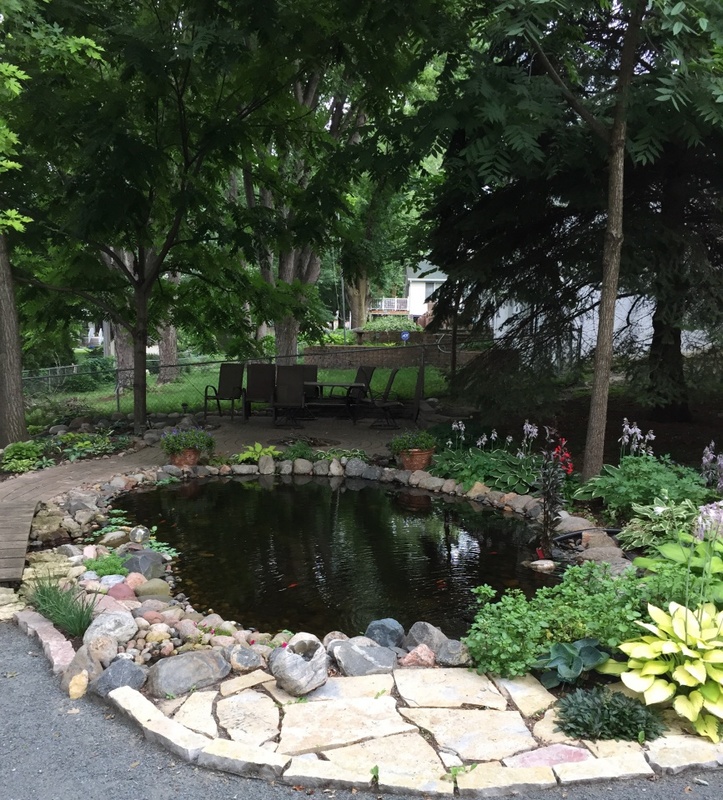 This landscaped yard filled with flowers and hostas along with the water features makes it a welcoming place for a variety of birds. This suburban city lot contains several water features including a 4 ft deep pond with waterfall, Koi, and water plants. 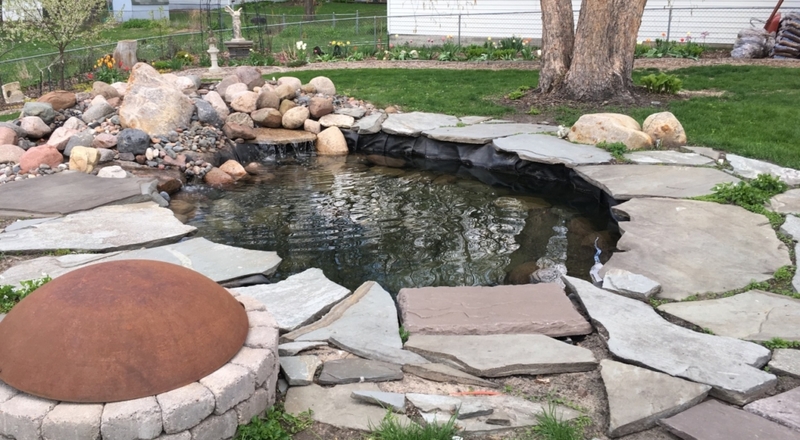 Be sure to check out the small pond and water orb in the front yard and more fountains in the backyard. The landscape showcases a cactus garden, perennials, a variety of tropical plants, and an 8 ft tunnel of Minnesota hardy Wisteria. Don’t miss the garden art and greenhouse for over wintering those tropical plants. 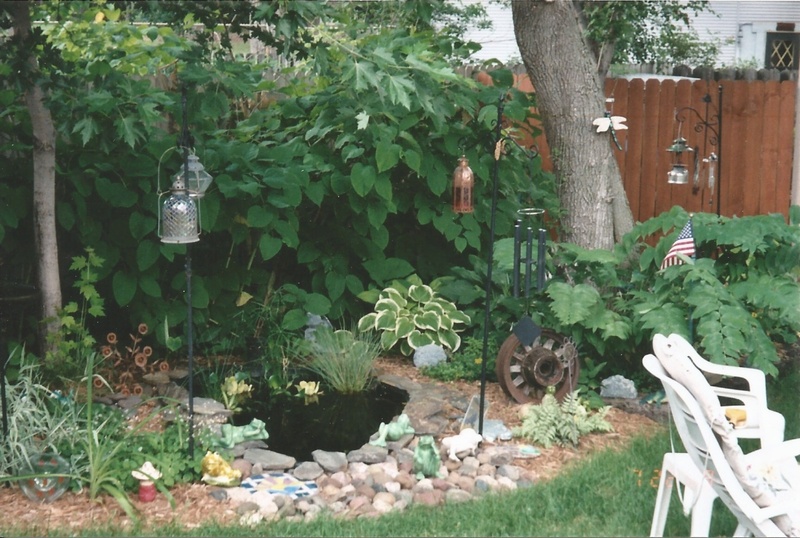 This rustic cottage garden features a pond edged with New England Blue Flagstone. 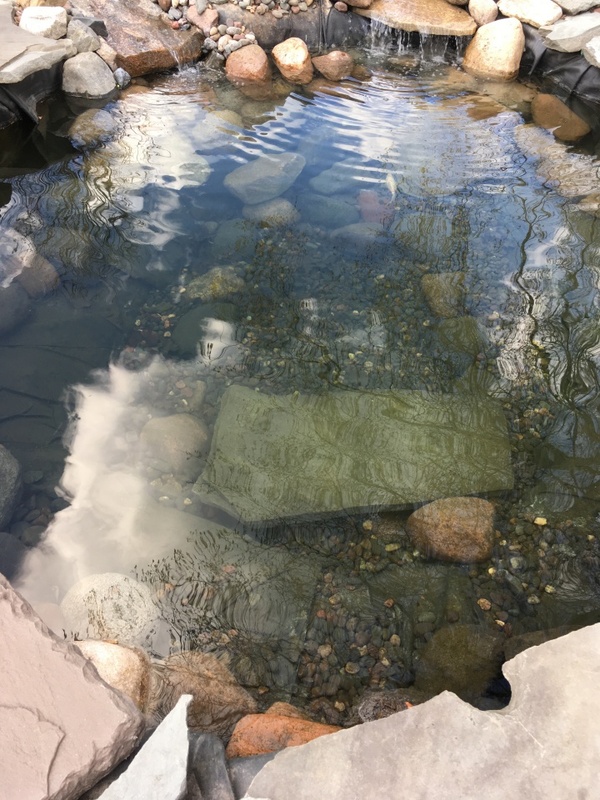 The pond is home to Koi and uses an ion gen copper unit to control algae. The site also contains a collection of fruit trees and a vegetable garden area. Enjoy the sound of the waterfall from the deck swing. This 1 ½ acre site has been in development over the past 10 years. 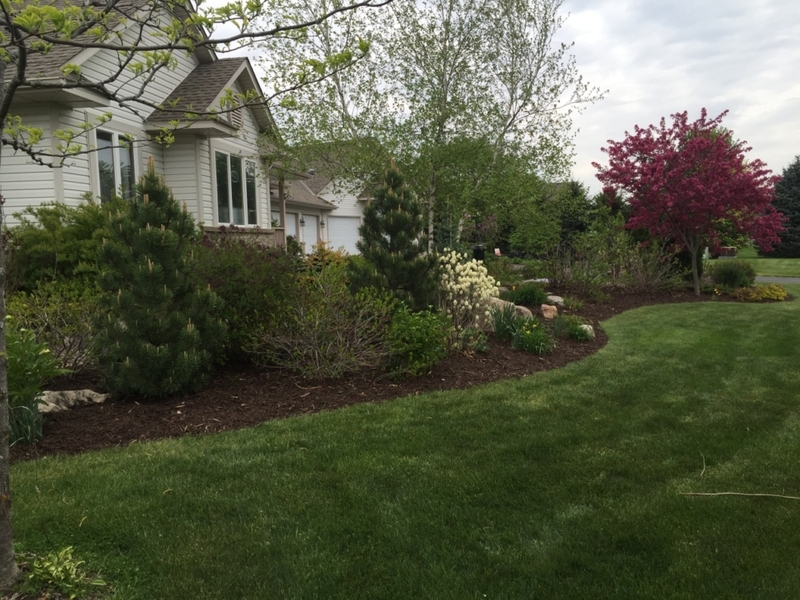 Walk through a beautiful mixed border of trees, shrubs and perennials with interest for all seasons. Then pass through a circular patch of grass that entertains the fairies. The pond is 5 feet deep with a bog area where the water is only a few inches deep. 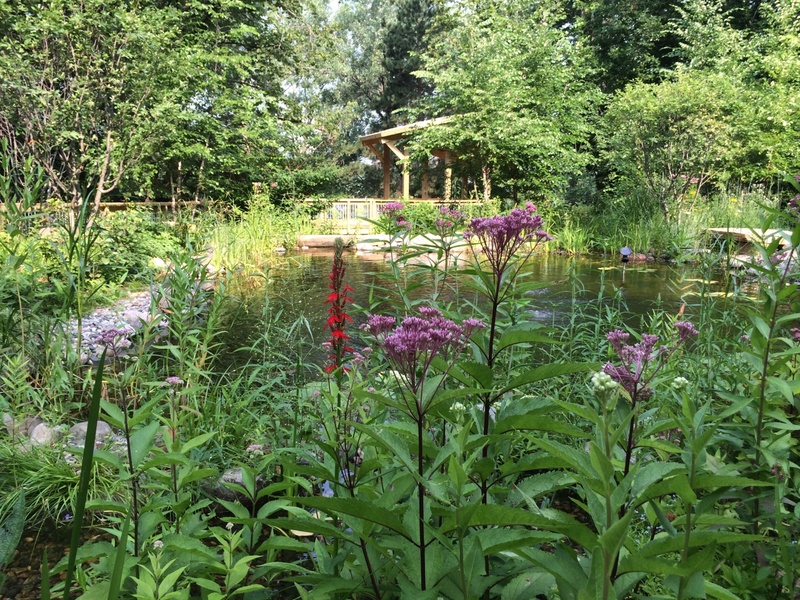 This area is planted with iris, arrowhead, and many other varieties of water plants. 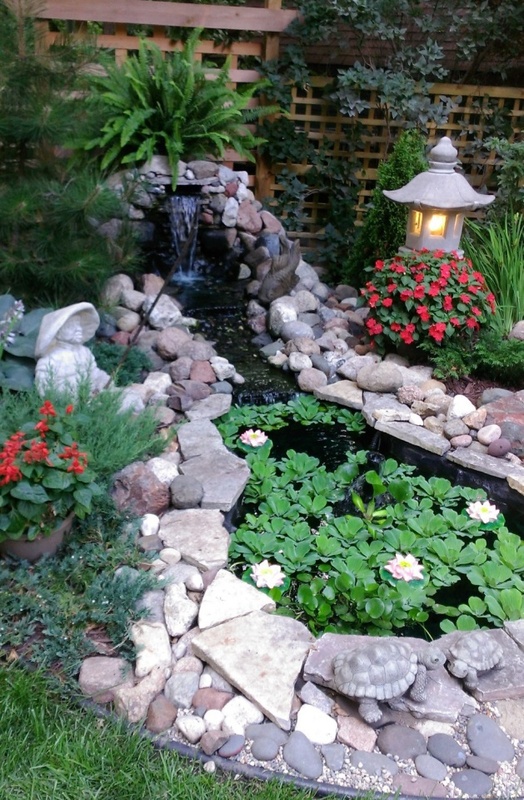 The deep portion of the pond is perfect for water lilies and goldfish. 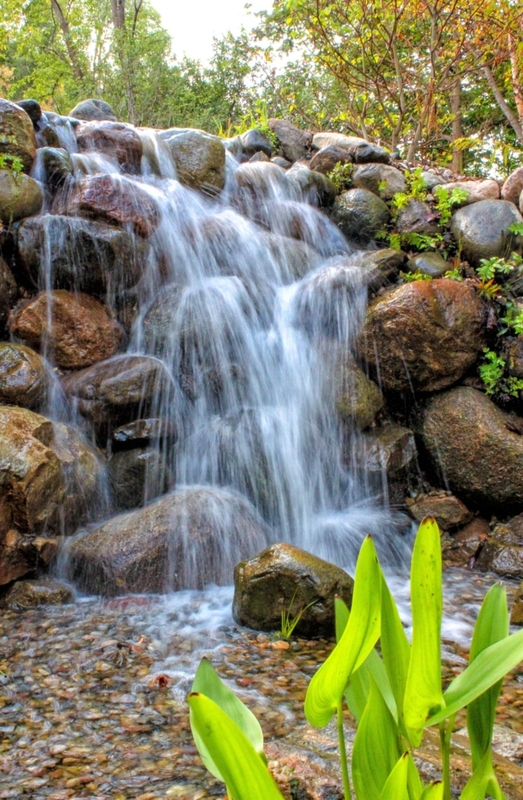 A stream with a waterfall completes the pond and provides the soothing sound of water. 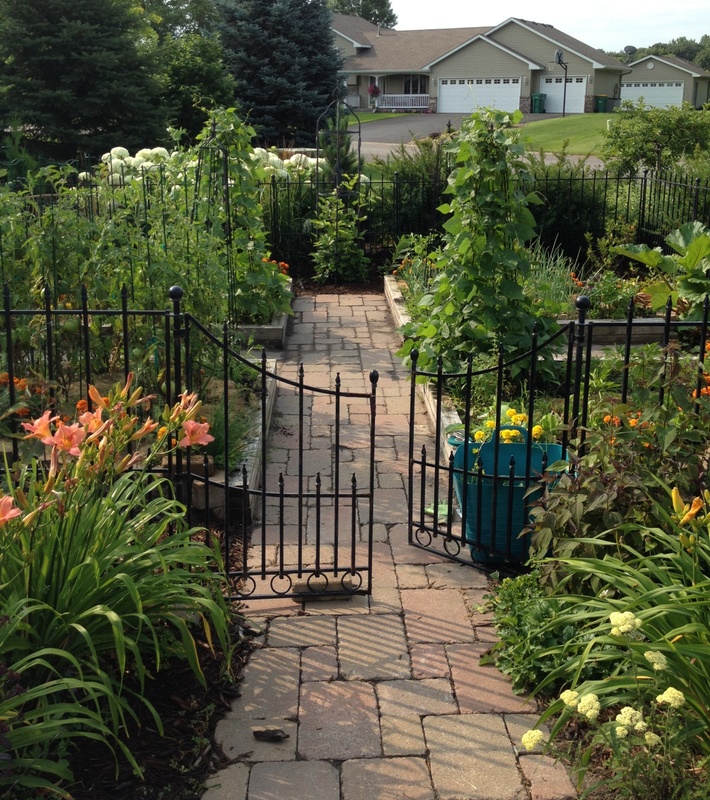 Don’t miss the vegetable garden tucked into the border on the east side of the driveway.